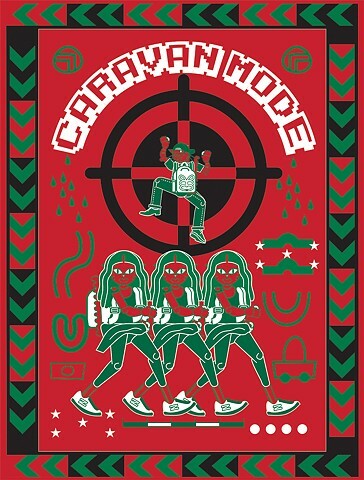 Caravan Mode is based on the 2018 grand migrant caravan traveling from Honduras into the United States. The print’s title, within the world of competitive video games, refers to a kind of gameplay where players compete to score as high as possible within the allotted timeframe. In my print composition, I’ve depicted several definitions of the word ‘Caravan’ to illustrate recently published sentiments of the Honduran migrants’ journeys.